Why do Christians leave the Church or decide they are atheist? As I was talking to a man the other day, I wasn't shocked to hear he grew up in the church and decided he was better off without the church or God for that matter. He was angry and bitter towards the church and God's Word. As I thought about the situation, I realized, there are many who walk away from God. Why is that you ask? The answer is rather simple, lets look at the scripture! Matthew 13:1 That same day Jesus went out of the house and sat by the lake. Such large crowds gathered around him that he got into a boat and sat in it, while all the people stood on the shore. Then he told them many things in parables, saying: “A farmer went out to sow his seed. As he was scattering the seed, some fell along the path, and the birds came and ate it up.Some fell on rocky places, where it did not have much soil. It sprang up quickly, because the soil was shallow. But when the sun came up, the plants were scorched, and they withered because they had no root. Other seed fell among thorns, which grew up and choked the plants. Still other seed fell on good soil, where it produced a crop—a hundred, sixty or thirty times what was sown. The Answer: There are 4 types of Soil! Notice the evil one takes away what was sown in his heart. These are not people who have not heard the message of God these are people who had the word of God sown in their heart. They just don't get what it's about. They may even pretend to be of God and went to church out of obedience to parents or tradition. They went through the motions. #2 Those who fall away after receiving it with Joy! For example those who hear it as a child but they don't put it to use. They don't apply it. The read the Bible and see it as face value not something that can change their lives. They may think it's great but for someone else. They see God is only a short term answer. #3 Those who fall away after the world and because of trouble. These are the people where God is not part of their everyday lives. They fall in love with the world. Those who sin is more attractive than what the Bible has to say. Those who lose a loved one and cannot forgive God. Those who separate from God instead of coming to him in times of trouble. There desires rule them. 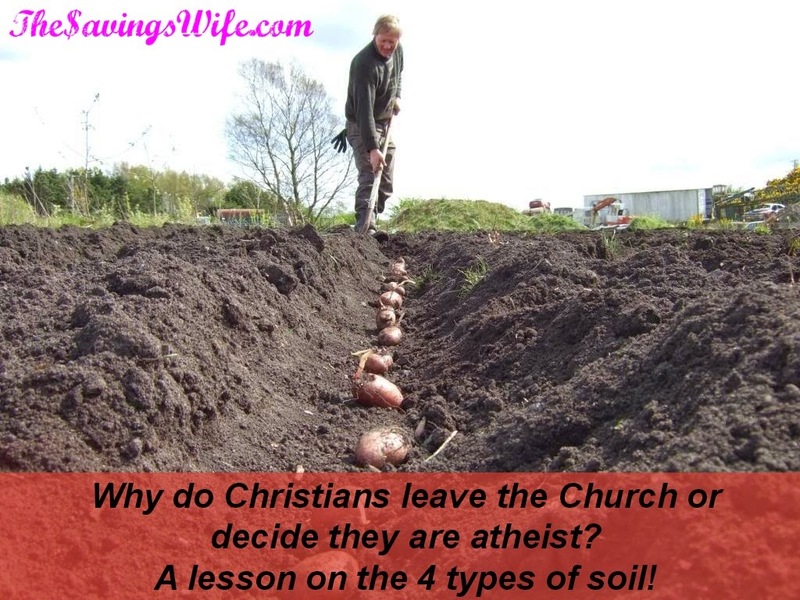 #4 The last is the Good soil that produces a crop! What does the good crop look like? They Trust God for their needs and for their choices in life. They live Holy Lives. They are set apart, different from the world. They choose Love instead of Hate, Peace instead of War. When people meet them they know they are different and God is large part of their life. They speak of him often and pray often. They have a relationship with God. They memorize scripture and God's words often replace their own. What can you do for those who have fallen away? But most importantly "Love" them!